A slew of new shops—and several attractive seasonal pop-ups—has landed in Atlanta in time for holiday shopping. Luxury shoe retailer Christian Louboutin rolled out the red carpet (literally, there is red carpet) at Buckhead Atlanta with its signature (trademarked) red soles and gleaming handbags, including a python clutch and matching messenger-style bag exclusive to Atlanta. Flamboyantly colored women’s stilettos teeter on the shelves up front, glittering with crystal and lacquer, and in a second room, men’s loafers and sneakers boldly do the same, with velvet, jewel tones, and candy-colored studs. One of the Buckhead store’s signature features is printed vinyl wallpaper—now featuring a scene of elegant birds—that will rotate with the seasonal collections. It’s a jewel box of a store, but you won’t get out of there cheap unless you leave empty-handed; basic pumps start around $675, but add a little decoration and you’re easily in the four digits. Meanwhile, on the Westside, things have kicked into full throttle for the buying season. 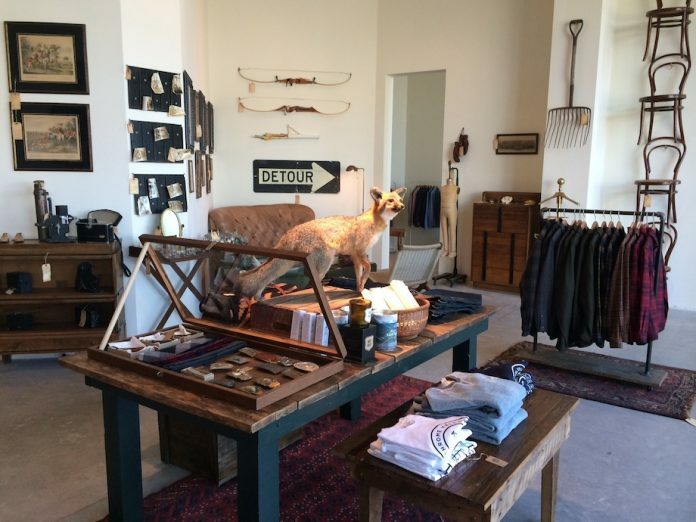 One shop not out to make a scene is the Philly-based men’s custom suiting company Commonwealth Proper, which recently opened a handsome showroom with a hidden speakeasy-style door in the Elan Westside building. Founded by Craig Arthur Von Schroeder (real name) and run in Atlanta by Mike Mast, who moved down from their Philly base, Commonwealth Proper is a true concierge service. They’re small—it’s only their second shop—and all about the details, from good counsel and old whiskey to the perfect fit. This isn’t your Southern style though, guys—they lean more American metropolitan than Southern or European. In fact, suits, which start at $1,950, are 100 percent made in the U.S. of A. Also find gorgeous silk ties and jaunty patterned pocket squares off the rack. Next door in the same building, the new Kane boutique is running a shop filled with our favorite standbys, like Tibi and Rebecca Taylor, but also some surprises, like Marie Turnor “Lunch” sack clutches and Mignonne Gavigan beaded collars. It’s the first boutique we know of in the city to carry two cool brands with Atlanta roots; New York–based women’s line By Smith, started in Atlanta in 2010 by Pensacola native Smith Sinrod, and Ukies, a new local company revolutionizing the classic high-heeled pump into something unusually comfy. Across the street, it’s pop-ups galore in and around the Westside Provisions District, open through Christmas Eve. There’s Chrome Yellow Trading Company and Brick + Mortar, who combined the former’s clothing and accessories and the latter’s vintage furniture and knickknackery to create a permanent-feeling installation. What with the Pendleton shirts (him and her), denim work jackets, vintage belt buckles, antique tennis racquets, old globes on top of school desks, and taxidermy, it’s a lot like scout camp meets après-ski, also known as a Wes Anderson movie. Chrome Yellow plans for a new permanent location on Edgewood this spring. Another collaboration popped up between Atlanta-based online retailer Les Nouvelles and the local fashion incubator, Factory Girls. Find labels like Clare Vivier, A.L.C., and Rag & Bone, plus the best of local fashion: silk scarves by Hannah Cross and women’s ready-to-wear by Abbey Glass (think more structured, classic silhouettes) and Megan Huntz (more slinky silks and quirky prints). A third pop-up from Crafted Westside, in a space across from Yeah! Burger, features all locally made goods, from stationery and jewelry to Res Ipsa loafers and ties. But the Westside’s not the only spot with great pop-ups. Online retailer Waiting on Martha, by Mandy Kellogg Rye, has set up in Shops Around Lenox, offering Kate Spade and Sugar Paper stationery, a men’s table of brawny soaps and candles that smell like trees, and a baby section with Fiona Walker felt animals. Like the temp shops on the Westside, it’s been installed with care, featuring a hip neon sign, patterned rugs, and perfectly arranged tablescapes—as if it were there for more than a short run. Looking for local stuff that’s more crafty or vintage? Stocking stuffers? There’s the ever-popular ICE pop-up from the Indie Craft Experience in Candler Park, with stuff from more than 70 makers around the country. This Friday and Saturday, check out their event at the High with more than 55 artists from across the Southeast. Next up? CH Carolina Herrera is set to open this week at Lenox Square, and the snappy men’s online retailer Bonobos brings one of its “guideshops” to Buckhead Atlanta, with a grand opening party this Thursday.